Thymosin /34 has a molecular weight of 4982 and also has its N-terminal amino acid residue blocked by an acetyl group (Figure 17-6). It is the predominant thymosin in mammalian cells. This protein induces the expression of terminal deoxynucleotidyltransferase in transferase-negative mouse bone marrow cells in vitro and in vivo and increases the activity of this enzyme in hydrocortisone immune-suppressed mice in vivo. Thymosin /34 therefore acts on lymphoid stem cells and in the early maturation process of thymus-dependent lymphocytes. The primary sequence of thymosin /34, like that of thymosin ay does not show homology with the sequences of other known proteins. However, there is an internal sequence duplication. Although it would be attractive to consider thymosin /34 as a discrete hormone of the thymus, it appears in many tissues. No pro- or prepropeptide is formed as its precursor, and in mammalian tissues it is usually accompanied by a related peptide, thymosin fiV]. Thymosin /34 and fivi probably are not secretory peptide hormones. FIGURE 17-9 Proposed mechanism of Tctj and T/34 action. 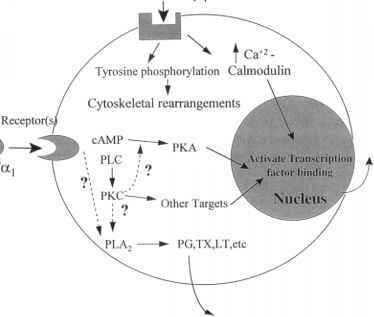 T«i activity has been associated with activation of cAMP/PKA- and PLC/PKC-dependent pathways. These second messenger pathways are typically G-protein receptor linked. Tc*i activity involves the production of prostaglandins and the activation of phospholipase A2 (PLA2). It is currently unknown whether the activation of PLA2 is directly through a receptor-mediated event or distal to the activation of PKC. The downstream targets of both PKC and PKA are transcription factors involved in cellular activation. The production of arachidonic acid metabolites have also been found to have significant effects on immune cell function. Although a large body of evidence has defined Tfit as a major intracellular actin sequestering protein, exogenous T/34 action has also been associated with the activation of tyrosine phosphorylation and increases in cytosolic calcium increases with subsequent alterations in cellular actin content (courtesy of Dr. Allan Goldstein, George Washington University, 1996). in bone marrow cells. 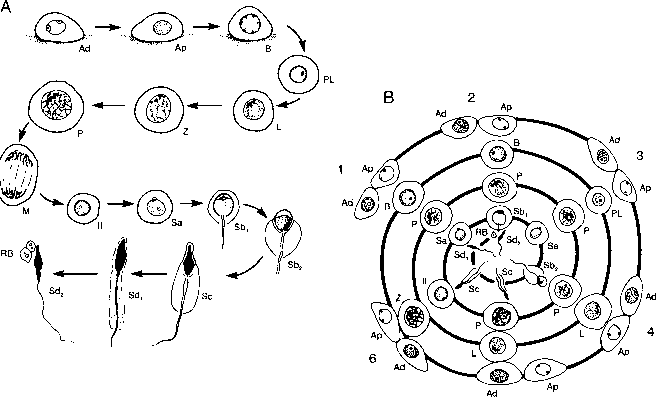 Incubation of [3H]thymosin /34 with intact or lysed bone marrow cells generated [3H]Ac-SDKP, and the tetrapeptide was not degraded further. Thus, Ac-SDKP appears to be a new regulator of the hemopoietic system. The mRNA for thymosin /34 increases in fibroblasts induced to proliferate at the Gl-S transition even in the presence of cycloheximide, but not in synchronized cycling cells. Thus, thymosin j84 is regulated by cell proliferation, but it is not a cell cycle-regulated gene. Thymosin /34 synergizes with GM-CSF in myelo-poiesis. There is a protein that binds thymosin (34, which is an elastase inhibitor. It is related to the serpin (serine protease inhibitor) family and plasminogen activator inhibitor 2. Thus, the physiological role of elastase inhibitors may be the thymosin /^-regulated rearrangement of leukocyte cytoskeleton components (see Figure 17.9).